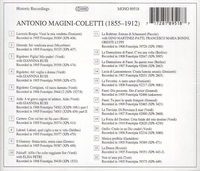 "Magini-Coletti studied singing during the 1870s with the distinguished pedagogue Venceslao Persichini at Rome's Conservatorio di Santa Cecilia. (Persichini's other students included the lyric tenor Francesco Marconi and Magini-Coletti's fellow baritones Mattia Battistini, Giuseppe De Luca and Titta Ruffo.) In 1880, Magini-Colleti made his operatic debut at Rome's Teatro Costanzi, as Valentin in Gounod's FAUST. He continued to perform regularly at that opera house for the next seven years, in addition to making guest appearances in Venice, Florence, Naples and other Italian cities. In 1887 he joined the roster at La Scala, remaining there for three seasons and singing a variety of leading baritone roles. Between 1888 and 1891, Magini-Coletti sang to acclaim in Spain, Portugal, Germany, Austria and France. He also crossed the Atlantic for a series of operatic engagements in Argentina, receiving further plaudits. In 1891 he joined the stellar roster of singers at the Metropolitan Opera, participating in a two-month North American tour. His first performance with the Met touring company occurred on 9 November, in Chicago, as Telramund in LOHENGRIN. On 14 December, 1891, Magini-Coletti made a successful debut at the Metropolitan Opera House singing Capulet in Gounod's ROMEO ET JULIETTE. He performed numerous roles at that house over the next 12 months. Magini-Coletti left America in 1892 and proceeded to pursue a busy schedule of operatic performances in Italy and other European countries, venturing as far afield as Russia and becoming a frequent guest artist at both the Opéra de Monte-Carlo in Monaco and the Royal Opera, Covent Garden. In 1900, he rejoined the La Scala company, performing numerous roles there for three seasons. Most notably, he appeared in the premiere of Mascagni's LE MASCHERE in 1901. Also in 1901, he sang at La Scala in a memorial concert held to mark the recent death of Verdi, with Francesco Tamagno in a scene from LA FORZA DEL DESTINO. The following year, he participated in La Scala's first ever production of Weber's EURYANTHE. Magini-Colleti sang often under the baton of Arturo Toscanini, La Scala's principal conductor, during this period. Toscanini was an ardent advocate of Wagner's music and he conducted Magini-Coletti in performances of TRISTAN UND ISOLDE, DIE WALKURE and LOHENGRIN. These landmark Wagnerian productions often featured Magini-Coletti's La Scala colleague Giuseppe Borgatti - Italy's greatest heldentenor."